Bobrick 2860 304 Stainless Steel Surface Mounted Toll Towel Dispenser, Satin Finish, 11-3/4'' Width x 15'' Height x 9'' Depth by Bobrick at Natural Green Cleaners. MPN: 2860. Hurry! Limited time offer. Offer valid only while supplies last. Surface-mounted roll-paper-towel dispenser shall be type-304 stainless steel with all-welded construction; exposed surfaces shall have satin fi nish. Surface-mounted roll-paper-towel dispenser shall be type-304 stainless steel with all-welded construction; exposed surfaces shall have satin fi nish. Door shall be secured to cabinet with a full-length stainless steel piano-hinge. 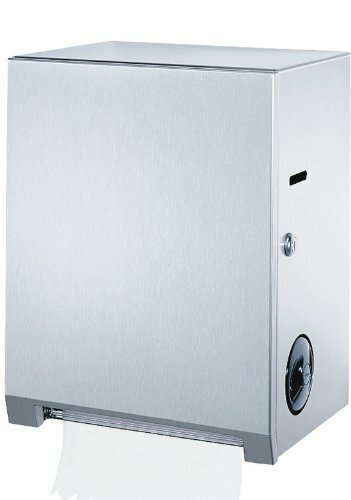 Unit shall be equipped with a tumbler lock keyed like other Bobrick washroom accessories. Towel mechanism accommodates up to 8" (205mm) wide, 8" (205mm) diameter, non-perforated paper towel rolls. Touch-Free pull towel mechanism dispenses one 12" (305mm) length of towel paper per pull. User only touches the paper. Automatic transfer shall dispense stub roll up to 3-1/2" (90mm) diameter before new roll is dispensed. Equipped with paper towel feed wheel for use in fi lling the dispenser, for user to advance paper should it become necessary to feed paper through dispenser. Paper towels are dispensed with pull force to operate 1.8 pounds (8.0 N) to comply with barrier-free accessibility guidelines. Measures 11-3/4" width by 15 height by 9" depth.